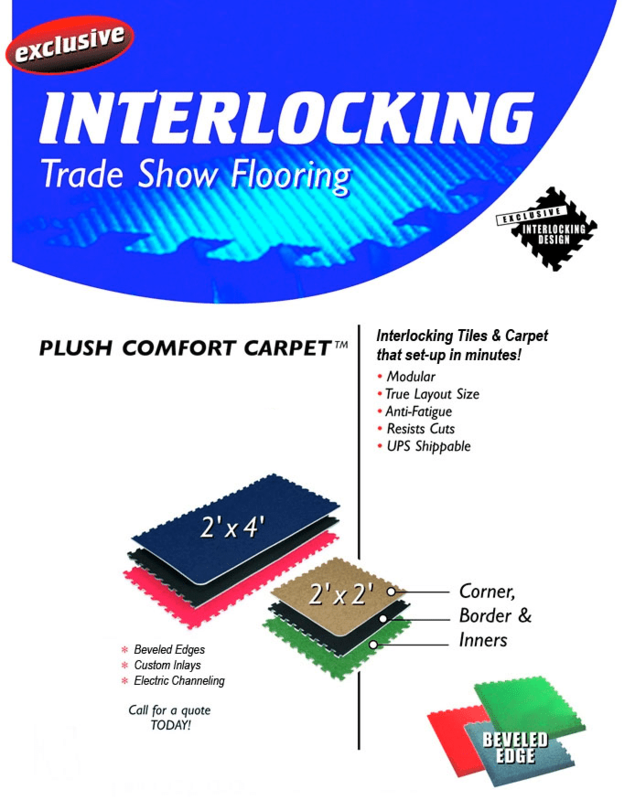 When it comes to trade show flooring or exhibition marketing, Interlock Carpet Foam mats are an excellent choice. These Carpet Tiles also know as SoftCarpets Tiles. The exhibit carpet tiles offer customized true layout sizes including 10’ x 10’ or 10’ x 20’ with 2’ x 2 or 2’ x 4’ tiles for trade show booths. These anti-fatigue tiles are great for conferences, expos, hotels, retail shops or stores. It feels like Plush Comfort Carpet that is top-quality, portable, comfortable and best of all, durable. These tiles give a professional appear with convenient maintenance. Ultimately, when you’re looking for a comfortable surface for trade shows, these are what you want! First of all, they are placed directly on a surface with no adhesive needed. They are easy to install, easy to take apart all while being lightweight and portable. Mix and match varieties in order to create a custom design that fits your vision, message or existing booth design. Their interlocking design offers anti-fatigue and insulation advantages that are similar to that of carpeting. Interlocking carpet foam mats are also odor proof and waterproof. They’re easy to clean too! These tiles can be vacuumed or hand cleaned. Installation is simple. The carpet is bonded to a durable foam base, which offers a strong tile that can handle furniture or foot traffic easily. Each tile is considerably wide, which allows you to install an entire space for a large booth quickly. The edges of the tiles themselves are cut into a puzzle design, which creates a firm hold. This means once your interlocking carpet foam mats are installed, you don’t have to worry about them coming apart at the seams (there are minimal ones). Border strips are also included, so you have everything you need to put together this top-quality flooring for your next event. Choose from 13 different colors, making it easy to match with your existing exhibition marketing and/or design. 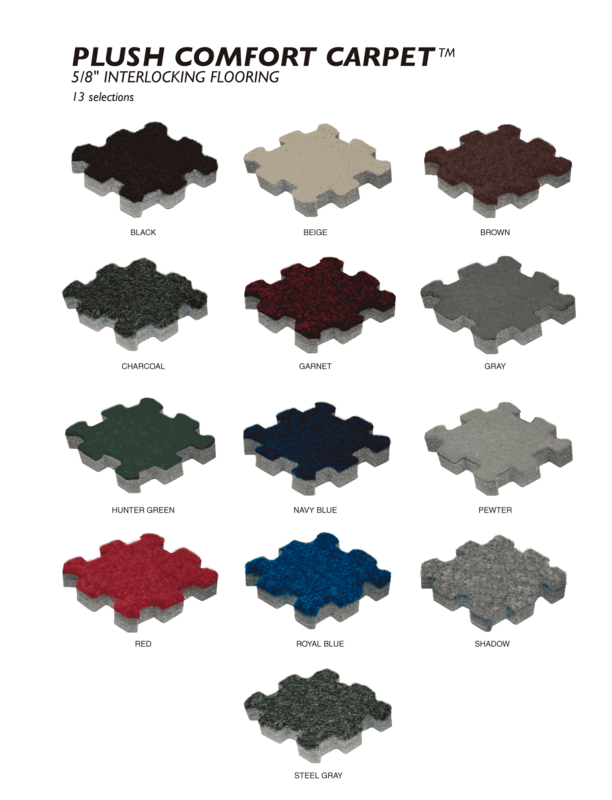 The material these interlocking carpet foam mats are made from are soft, thick and comfortable to walk on, making them a great option for a variety of places including trade show booths, retail store floors or hotel lobbies. These places require a lasting and durable carpet tile, especially behind counters. This is designed to last and made of only the highest-quality materials. These tiles come in 2’x4′, clients who want them in 2’x2′ then they can be cut down into 2’x2′ tiles. Choose the interlocking carpet tile surface that meets your style. Anti-fatigue mats are great for times you’re on your feet for hours including at retail stores or at conferences. Please note that they are strong enough to last under chairs or tables, but heavier items may leave indents. At Capital Exhibits, we guarantee your satisfaction when choosing from our selection of quality flooring options. For more information on interlocking carpet foam mats and what options we have available, contact our professional team at Capital Exhibits today!